After Shen Yun Performing Arts staged seven successful shows in New York's Radio City Music Hall in February 2006, the Broadway magazine Billboard listed Shen Yun as one of the seven top shows in the United States. In the next few years, Shen Yun has built up her reputation through its world tours and created a great sensation in mainstream society and among overseas Chinese. Shen Yun has enabled people to break long-term ideological shackles the Communist Party culture and brainwashing had subjected them to, so that they are able to appreciate true, traditional Chinese divinely-inspired culture. Shen Yun performances contain messages about freedom of belief, human rights and the persecution of Falun Gong, the Chinese Communist Party (CCP) views as the biggest threat to its dictatorship. The dictatorial regime's embassies and consulates have worked closely with the 610 Office and used various tactics to try to prevent people from watching Shen Yun shows. These methods include harassments of the shows' sponsors, massive phone calls to disrupt ticket-selling hotlines, threatening overseas Chinese communities, writing defamatory letters to VIPs, and pretending to be Falun Gong practitioners. To increase their overseas propaganda, the CCP’s Central 610 Office created an anti-Falun Gong “professional website” in July 2006, called kaiwind.com. The World Organization to Investigate the Persecution of Falun Gong (WOIPFG) has carried out an investigation into this incident. The investigation report focuses primarily on and reveals the facts how the 610 Office and the Communist regime embassies and consulates tried to sabotage Shen Yun shows. Following the creation of kaiwind.com in Chinese language in July 2006, seven websites in English, Russian, German, Spanish, French, Korean and Japanese languages were also established since October 2007. According to incomplete statistics, in the last four years, the so-called “open to all Chinese around the world” website “Kaiwind.com” has published more than 230 articles (including reprinted ones) to defame Shen Yun shows. Most of these unscrupulously abusive and slanderous articles were from anti-cult associations writing teams at various levels, and from members of the 610 Office, under the following names: reporter Li Jie (厉 洁), correspondent Yi Jiayan (易家言) and writers: Chen Jingyuan (陈景远), Jiang Tao (江涛), Zhang Zhongde (张仲德), Yu Jun (余军), Dan Lin (丹琳), Baoshansi (宝善寺), Baiyizi (白衣子), Chu Jun (楚钧), Shuangr Ren (霜刃), Luo Zhijun (骆志军), Gang Jianwei (刚健为), Tai Ran (泰然), Qin Feng (秦风), Lu Guoliang (卢国梁), Hai Bo (海波), Zheng Yi (郑怡), Xu Yan (许言), Bu Xin (卜心), Hao Ran (皓然), Tian Ming (天鸣), Mu Yi (沐呓), Li Fen (李芬)(translator and editor), Xu Qiang (translator and editor), Ai Zhang (艾章) (translator and editor), Nanhuaiyin (南怀隐) (translator and editor) , Zhang He (张鹤) blog, Xiangrui (相瑞) blog. Kaiwind.com and the Chinese embassies and consulates  also reprinted several articles from the "Western media" that relayed/quoted the views of the CCP embassies and overseas Chinese community leaders, as representative views of the “mainstream” Western media and audiences, and repeatedly published them on the Internet, to confuse people and to fabricate so-called international public opinion to deceive people in China. 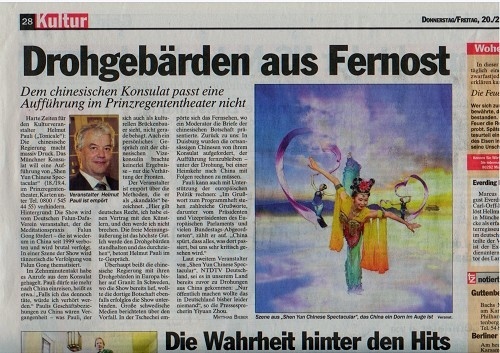 Munich Daily reported on March 20, 2008 the regime consulate's pressure on local performance company, entitled, "Threat from the Far East." Investigator: Are you vice consul Wang? I’m … I would like to inquire about something. How is it going with your effort to stop the Chinese Spectacular in Munich? show and talked to them about it, …and will try to let them give it up at this end. Investigator: What other measures have you taken besides this? Wang Yanmin: (We) have notified all the overseas Chinese and students not to attend any relevant activities. Overseas Chinese leaders and presidents of student associations have all expressed they would pass on the message to every Chinese. This is mainly what we have done so far. Wang Yanmin: From what we have learned from the company…, mainly we talked with the leader, … we strongly request you to give it up, cancel this event. I said as long as you take a step further, if you insist on doing so, to cooperate with Falun Gong, then we will be hard on you. 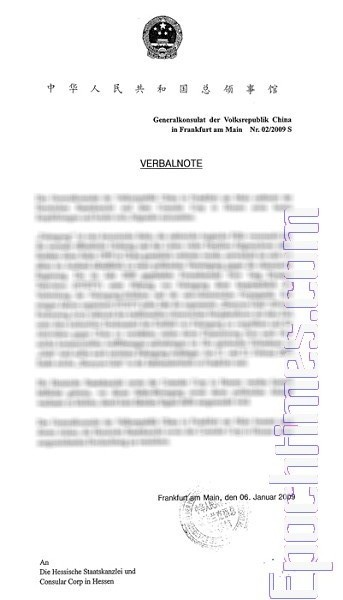 In future you won’t get any cooperation from us, either official or non-official, including all show business cooperation. …Of course, when I talk to their manager today, I will be even harder on him. … first, we will notify all overseas Chinese that we won’t attend your event; secondly, naturally, as for all your business activities with China in the future, don’t expect to get any cooperation. We can inform all organizations in China about you, requesting them not to involve you in any relevant activities. In addition, we will take further measures, meaning to put you on a blacklist… you will need to consider the consequences for all of these; do you still want to cooperate with China or not? I will be even harsher when I talk to him." Investigator: …what about the government? Wang Yanmin: "Actually, in terms of this show…, no matter what my view is, we will clearly bring it up with the government so that government officials won’t attend such activities, and we will also tell them about the nature of Falun Gong, we will tell them our requests…." Denmark State TV (DR), the largest, with the highest audience rating, broadcast a 40-minute long program at 9:00 pm on March 18, 2008 entitled “Danish theater under pressure from Chinese Communist regime” (Kinesisk pres på Danmark i teatersag), in which it reported that the Danish State Opera House was going to stage a Shen Yun Spectacular arriving from the USA during the Easter Holiday, to showcase traditional Chinese culture. Officials from the Chinese embassy went to Danish Foreign Ministry on December 7, 2007 to exert pressure on the Danish government, requesting cancellation of the show. Due to the pressure from the regime embassy, the Danish Royal Opera House officials unilaterally cancelled the performance. 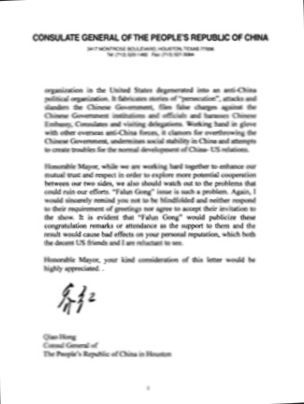 On December 23, 2007, the Epoch Times received a letter from Fort Lauderdale mayor Mr. Jim Naugle, making public the letter addressed to him by Consul General Qiao Hong from the CCP Consulate General in Houston. 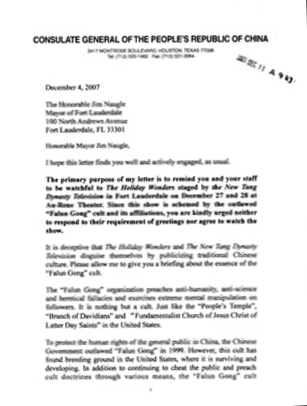 In the letter, Qiao Hong threatened Mr. Naugle that if he supported the Holiday Wonders hosted by NTDTV, his “personal reputation” would be negatively affected. Qiao Hong’s letter was dated December 4, 2007, bearing Qiao Hong’s Chinese signature. The beginning of this letter indicated in bold letters its intention - to make reference to the Holiday Wonders that would be hosted by NTDTV on December 27 and 28 in the Broward Center for the Performing Arts Au Rene Theater. In late January of 2010, in Little Rock, Arkansas, before Shen Yun started its grand performance in the best local theater, The Robinson Center Music Hall, the theater unveiled a letter from the Consulate General in Houston discrediting Shen Yun. This act by the Consulate General was extremely ridiculous and indicated that the consulate was nervous. On February 25, 2008, the regime embassy in Thailand published on its website the “Statement issued by the Chinese Embassy in the United States on May 12, 2006,” reproduced from 610 Office’s Kaiwind.com. This statement slandered the Chinese New Year Gala hosted by NTDTV in Washington D.C. in 2007. On February 18, 2006, the Global Chinese New Year Gala hosted by NTDTV took place in Sydney's famous State Theater. 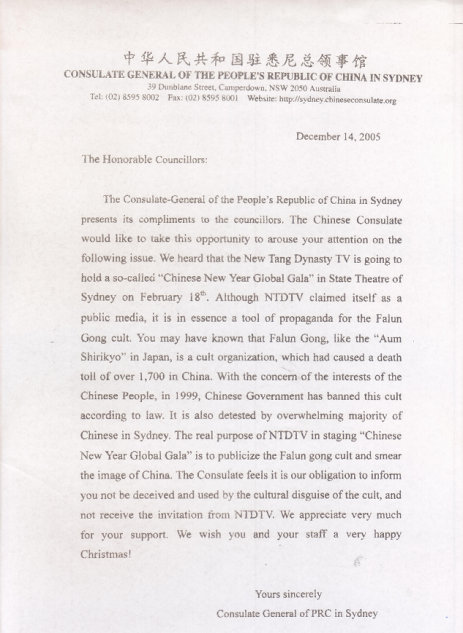 On December 14, 2005, the Consulate General in Sydney had sent defamatory letters to councils of all levels of government, demanding them to “not accept invitations by NTDTV” to the show. The letterhead displayed the Consulate General in Sydney, from where the letter was sent, but the letters were unsigned and missing the consulate's official seal. On March 17, 2008, an English-language newspaper in Malaysia, Malay Mail, published a large-scale report, accurately detailing how the CCP pressured the government of Malaysia into taking the unilateral action of cancelling Shen Yun’s performances scheduled in Malaysia. Afterwards, Yanping Xu, a professor in the Strategic Research Office in University for National Defense and a part-time professor of the International Affairs Research Office at Tsinghua University stated, “How can a country summon people to carry out revolutions in other countries? Isn’t this severely interfering in other countries’ internal politics and subverting the governments in other countries? How can (the CCP) manage to have good relationships with other countries under these circumstances?”  Obviously, the communist regime learned that by using the method of “cultural revolution” to have a “united world front” was a strategic mistake. In 1978, China started to become “open to the outside world.” Its domestic market’s large demand has excited the entire world. Many “profit-oriented” people try all kind of means to profit from it. Their mentality exactly panders to and connives the regime’s mean ambition of exporting its values to the outside world. This ambition is being inflated to the extreme, a situation that has intensified in recent years. The CCP disregards diplomatic conventions and unscrupulously uses its embassies, diplomats and spy networks to sabotage and interfere with the performance of Shen Yun Performing Arts on a global scale. This serves as a typical example of the communist’s vitriolic ambition. The CCP’s strategy is to use economic benefits to seduce and force the people from the West to relinquish their morals and value, thus shattering the Western countries’ illusion of improving human rights and freedom of speech in China through means of commercial activities. kaiwind.com, July 24, 2008 "key points for submissions"
 Shanxi anti-cults net: sxfxj.com "kaiwind opens multi-language websites"
 Website of Consulate-General of PRC in Chicago, 2009/02/05, "Expose the false propaganda of Shen Yun gala"
 Report on "The Epoch Times", February 21, 2009, "Letter from the Chinese Communist regime to interfere with German internal affairs exposed"
 DR Forside 18] mar. 2008 "Kinesisk pres på Danmark i teatersag". Los Angeles Times, USA, January 03, 2008|Christian Berthelsen, Times Staff Writer. "O.C. official 'insulted' by letter from Chinese government". American Mayor Exposed Chinese Consulate's Threatening Letter; Continues to Praise. The Epoch Times. December 23, 2007. Letter of Chinese Consulate Discrediting Shen Yun Exposed; Theater refused to be Interfered and Reported to FBI. The Epochtimes. January 21, 2010. Copy of 13-page letter from Chinese Consulate General in Houston: no signature or date. Chinese Embassy in United States. Falun Gong as Shen Yun Performance's Truth (in Both Chinese and English). Kaiwind com. To Understand Falun Gong is Shen Yun Performance's Truth. Chinese Embassy in United States. Weiyong. 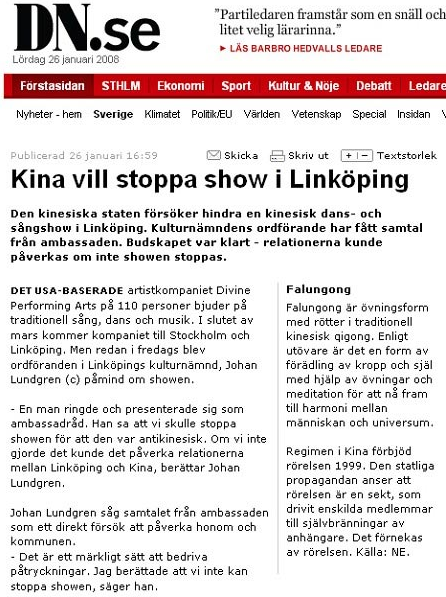 "CCP Spies Pretended to be Falun Gong to Write Threatening Letters to Theater; Case Reported to FBI". The Epoch Times. June 14, 2010. "CCP Consul Threatens Sponsor only to Help Shen Yun Warm Up". The Epoch Times. April 25, 2008. 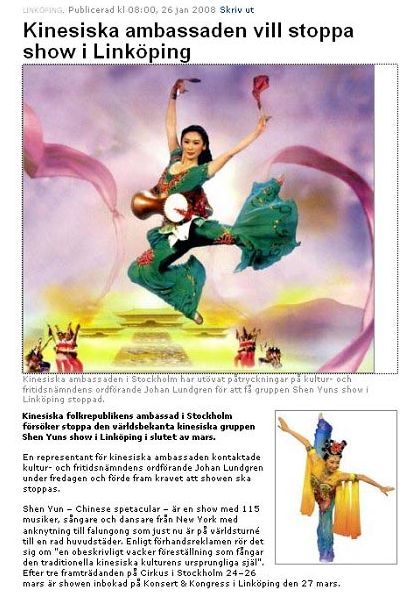 "CCP Consul General Xinjian Wu in Calgary Threatened Shen Yun Sponsor". "Australian Broadcasting Corporation –Lateline" Broadcast: 28/03/2007] Reporter: John Stewart. 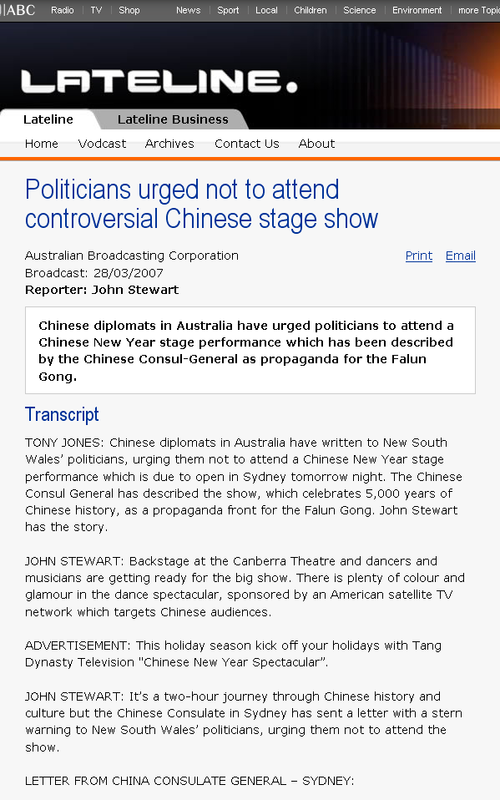 "Politicians urged not to attend controversial Chinese stage show"
 Mao Zedong. "New Democracy Ideology" (January 1940). University of Ningbo's Yongchao Net. Deng Xiaoping said: "Our country's culture is socialist culture. It must serve the socialist enterprise under the direction of Marx-Leninist ideology and the thinking of Mao Zedong." Bensi Xing: Commentary on Deng Xiaoping's Ideology on Building Socialist Mental Culture". Qiushi Publishing. South Net.